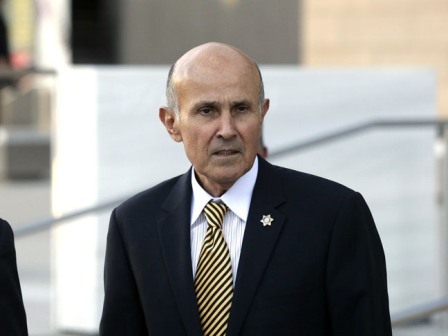 Defense attorneys renewed efforts Monday to keep former Los Angeles County Sheriff Lee Baca free on bond while he appeals his conviction on charges of obstruction of justice and making false statements. In a motion filed in Los Angeles federal court, attorney Ben Coleman wrote that Baca’s defense team will present “substantial” questions to the appeals court likely to result in reversal — with the goal of prevailing at a retrial. A three-judge panel of the U.S. 9th Circuit Court of Appeals last week upheld a ruling by U.S. District Judge Percy Anderson that Baca had not convincingly shown that he was not simply trying to delay serving his three-year prison sentence. The appeals panel sent the case back to Anderson to rule on Baca's renewed effort to bolster the bond request. Anderson will now rule on the new motion, which could lead to a second try with the 9th Circuit in which defense lawyers would provide additional evidence. Defense co-counsel Nathan Hochman said he plans to present evidence to show that a reversal is warranted based on judicial error and Baca should remain free while those issues are explored. The new motion argues that Anderson erred in barring jurors from hearing evidence of Baca’s “cooperation” with both the federal probe and an independent county review board, and that the panel should have heard about the ex-sheriff's Alzheimer’s disease diagnosis. Hochman also said that the use of an anonymous jury in Baca’s trial was a mistake that could result in a finding for a retrial. In its previous ruling, the appellate panel upheld Anderson's denial of the bond request, finding that Baca “failed to meet his burden in demonstrating that he filed this appeal for purpose other than delay,” according to the three-page order. Prosecutors had asked for a two-year prison term, noting that they would ordinarily seek about four years, but took into account Baca’s age and Alzheimer’s diagnosis. During the sentencing hearing, however, Anderson excoriated Baca, telling him that if it hadn't been for the ex-lawman’s health, Baca would have received the same five-year term given to Tanaka, the former undersheriff. Baca — who ran the nation’s largest sheriff's department for more than 15 years — was first tried in December on obstruction of justice and conspiracy to obstruct justice counts, and prosecutors had planned a second trial on the false statements count. But a mistrial was declared after jurors deadlocked 11-1 in favor of acquitting the former sheriff, and Anderson combined all three counts in the retrial. Baca did not take the stand in either trial. The charges stemmed from events six years ago when a cell phone was discovered in the hands of an inmate at the Men’s Central Jail. Sheriff’s deputies quickly tied the phone to the FBI, which had been conducting a secret probe of brutality against inmates. At that point, sheriff’s officials closed ranks and began an attempt to halt the formerly covert investigation by concealing the inmate-turned- informant from federal prosecutors, who had issued a summons for his grand jury appearance. Baca became sheriff in Decem­ber 1998 and won re-election on several occasions. He was poised to run again in 2014, but federal indictments unsealed in December 2013, related to excessive force in the jails and obstruction of that investigation, led Baca to retire the following month.